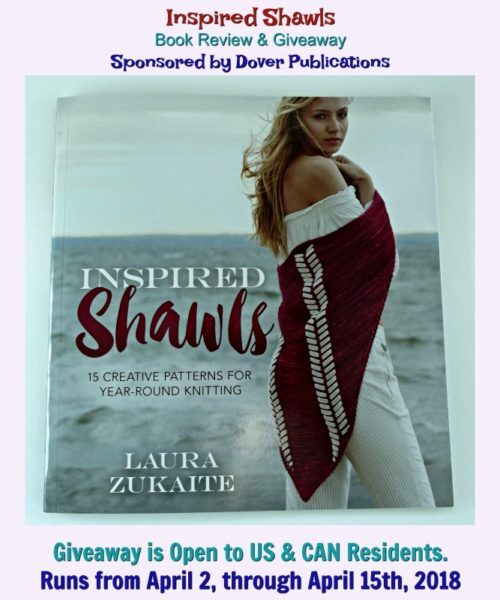 Inspired Shawls by Laura Zukaite, and published by Dover Publications was inspired by the beauty of South America. The knit shawls feature elegant stitch patterns, textures, and colorful designs that you’ll enjoy pairing up with your favorite outfits. The book contains 15 beautiful shawl knitting patterns in various shapes and sizes for every season and for every occasion. Two winners will receive a copy of Inspired Shawls. Giveaway is open to US and CAN residents, age 18 and over, and runs through April 15th, 2018. I have not knit in a long time, but this book makes me want to pick up my needles again. Not only do I love the beautiful designs and textures on the fabric, but the tassels on a few of these shawls are absolutely amazing! Although there are no skill levels listed with the patterns, the book states it’s perfect for all skill levels. And with a quick browse, I found a couple that are perfect for a beginner like myself. All abbreviations and special stitch instructions are included in the patterns. You’ll also find handy color and other charts for a few of the patterns. So there you have a brief overview of the book. And now, it’s your turn to enter for a chance to win your copy. That shawl on the front cover is so pretty! I almost feel like I can crochet something similar. I entered the giveaway. This would be a great book to work on my knitting skills with. I enjoy knitting and crocheting and am always looking for new patterns to try. I mostly create items to gift to friends and family but occasionally I make something for myself!